Bulls Back in Control - Is it time to buy Stock? Home Market Analysis Archive Bulls Back in Control – Is it time to buy Stock? In my market commentary on January 31st, I analyzed the current state of the U.S. Stock Markets, specifically the S&P 500. I discussed in detail that I expected the market to continue upwards after the consolidation. I have been strongly bullish since November and it has paid off with a 10% portfolio gain. You can see where I entered the market in my November Market Commentary Article. Since then I exited once to secure an 8% gain and then re-entered again last week. I have been investing the portfolio in primarily two Exchange Traded Funds (ETF’s) the QQQ and the ONEQ. This gives me the stability of taking advantage of the market move and not having the volatility of individual stocks. Also I only need to track the overall market and not try to follow ten or more stocks, this is basically diversification. So I am half way to my targeted 20% year on year growth. I know what you are thinking – “If he is using an index tracking ETF then he will only get the gains of the overall market, how will he beat the market? The answer of course is that you need to avoid the market’s down side. So, as the market gets oversold or starts to move down that is a good time to exit. As the market gets oversold after a downtrend that is the time to buy. Of course timing and good market analysis is key to success here, as it is for individual stocks or even trading Foreign Exchange (FOREX). Anatomy of the Break Out. I will run you through what just happened in the market, it is essentially a brief lesson of the core principles of Stock Analysis. 1st Break Out – here you can see as expected the price broke out upwards through the upper trend line. Testing Upper Trend Line – here we had what is referred to as a shake out, bears up the ante and start selling. This selling only managed to push the price down to the upper trend line of the triangle again. New High Break Out – here is where the Bears capitulated and the Bulls push the price up with vigorous buying. The price then make the new high exceeding the previous December high. 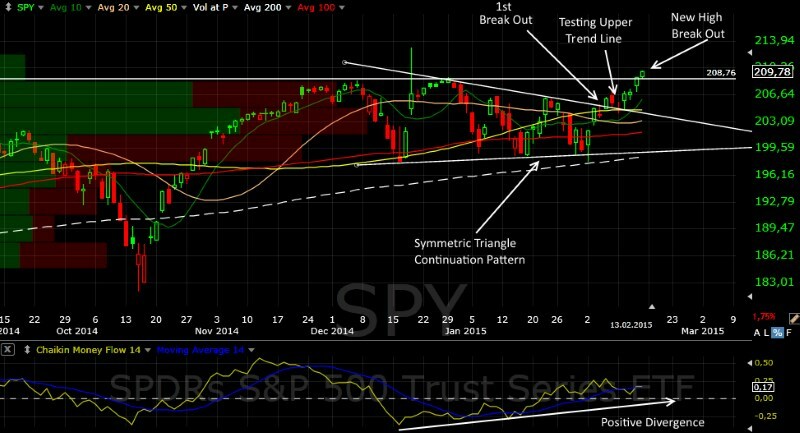 Positive Divergence – On December 15th the Market was moving down but it was very oversold. Since then the Chaikin Money Flow indicator has been moving steadily upward, while the actual prince trend was moving sideways. When an indicator is not moving with the price or contradicting it, it is called a divergence. In this case the divergence was positive meaning there is pressure in the system for the stock price to follow suit. It is very important for you to clearly understand Stock Chart Indicators and the use of Divergences. Up is the direction of the Bull, at least for now. Enjoy.